There are MANY different ways you can go with wedding invitations - some are super ornate with several different pieces, some are super simple with just a single card. We decided to do the latter option which is great for us because it's a) cheaper, and b) less wasteful. 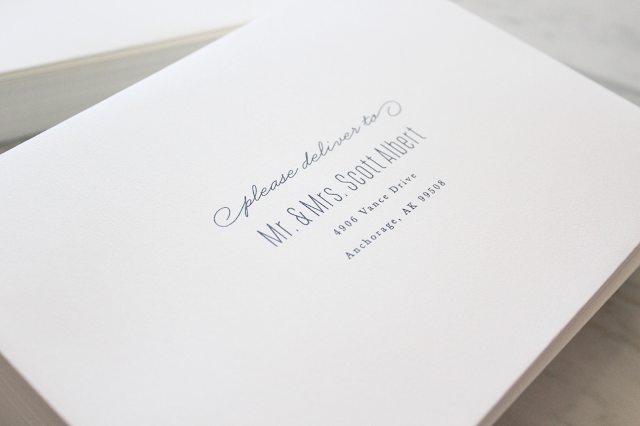 Our wedding RSVPs are being managed online and our meal is being served family-style so there is no need for guests to send back a RSVP or meal card. Minted, of course, has both of these options and many more, which is great because you can find the style that is perfect for you. 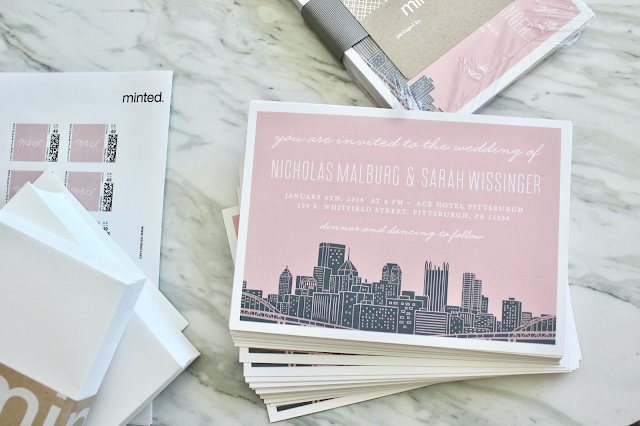 When you visit Minted's website, you'll find over 1,000 beautiful wedding invitation designs to choose from, but you can filter down your options by size, color, orientation, price, etc. 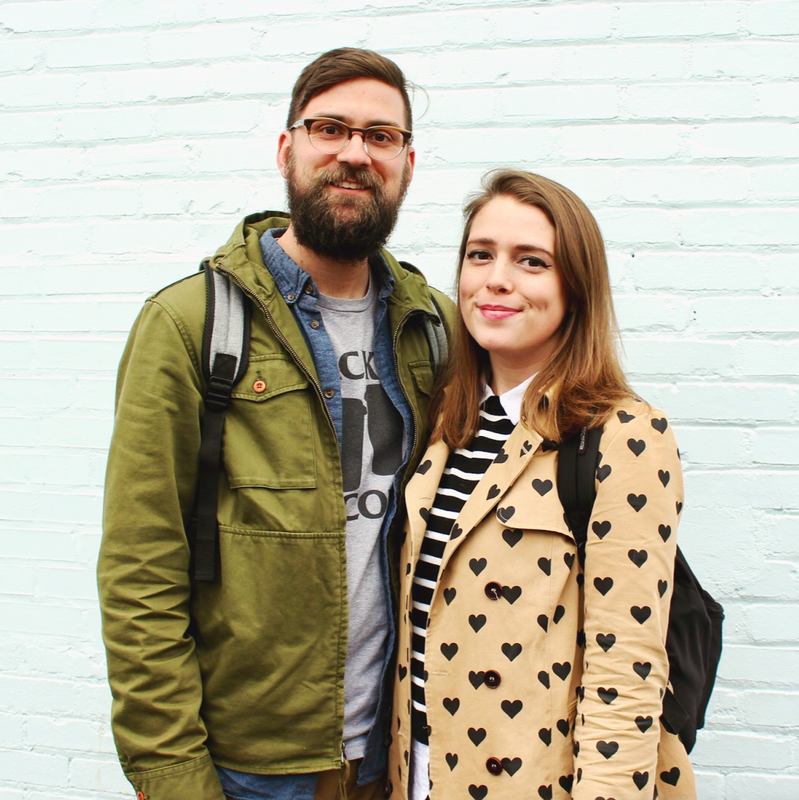 I first narrowed down our options to about 36 and we quickly picked a favorite. Are you thinking, "But those aren't the invitations you got...?" You're right! While we loved these (and still do!) 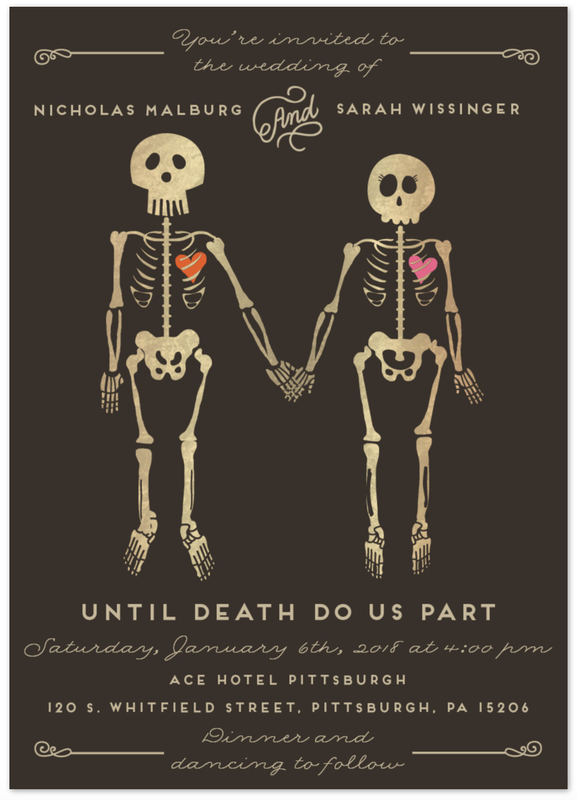 we later found a save the date design with the Pittsburgh skyline on it and knew it was perfect, especially with the majority of our guests traveling to Pittsburgh for our wedding. 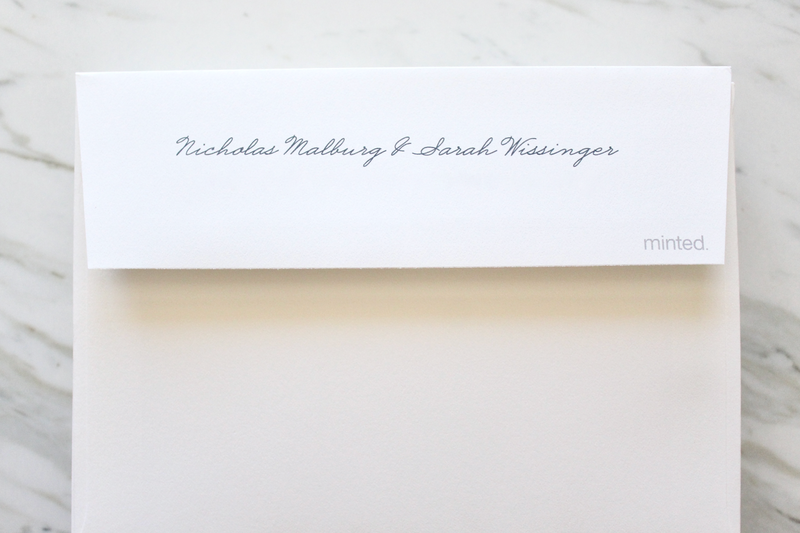 Luckily for us, Minted is so customizable that it didn't really matter that our design only came in save the dates - we simply changed the text on the front to turn this into the perfect #MeetTheMeowburgs invitation. 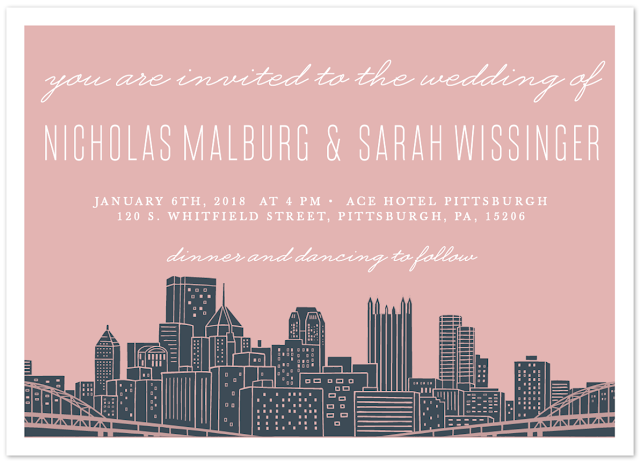 Before you even get into personalizing the text of the invitations, you get to do choose the silhouette, the color, the format, and the paper (we picked recycled paper!) So let's talk color. 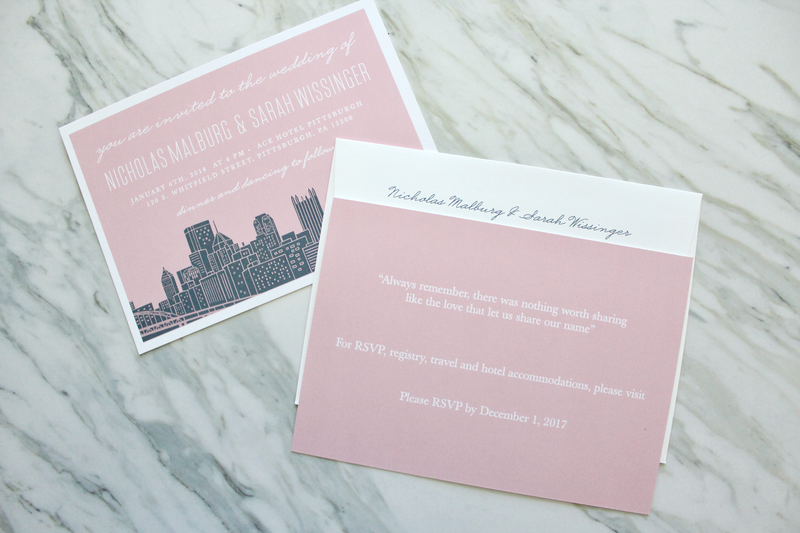 Our invitation had a few different color options available so we chose pink to go with our save the dates. 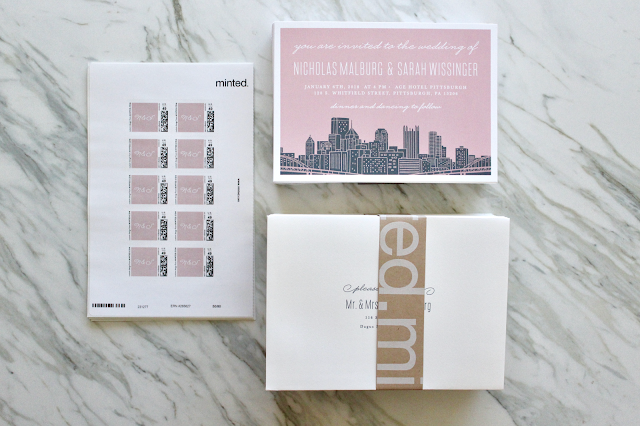 If you don't love any of the colors available on the site, not to worry, you can select a Pantone or CMYK color and Minted's designers will send you unlimited proofs until your invitations are perfect. 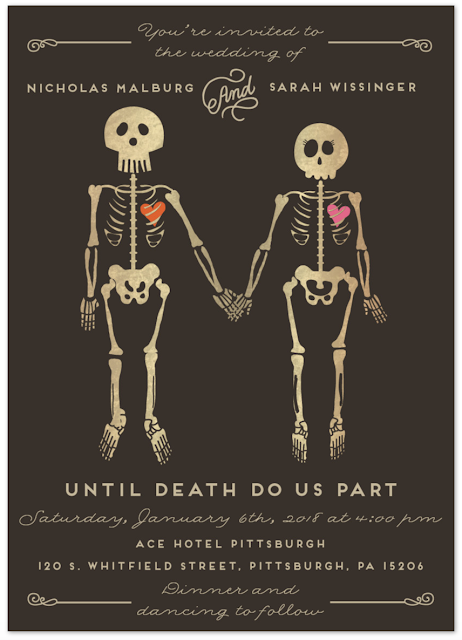 Okay, so the invitations are done. That's it, right? Nope. This process gets even better when you enter the envelope stage. When you have a large guest list, addressing wedding invitations can be insanely tiring and time intensive. To alleviate that problem, Minted offers free(!) recipient addressing. We used their Excel template to upload our guest's addresses and ta da! - our envelopes arrived already addressed for sending. It's amazing. The cherry on top of this whole process was the option to have custom stamps printed. Because why would you send a beautiful, custom wedding invitation with a boring post office stamp?! 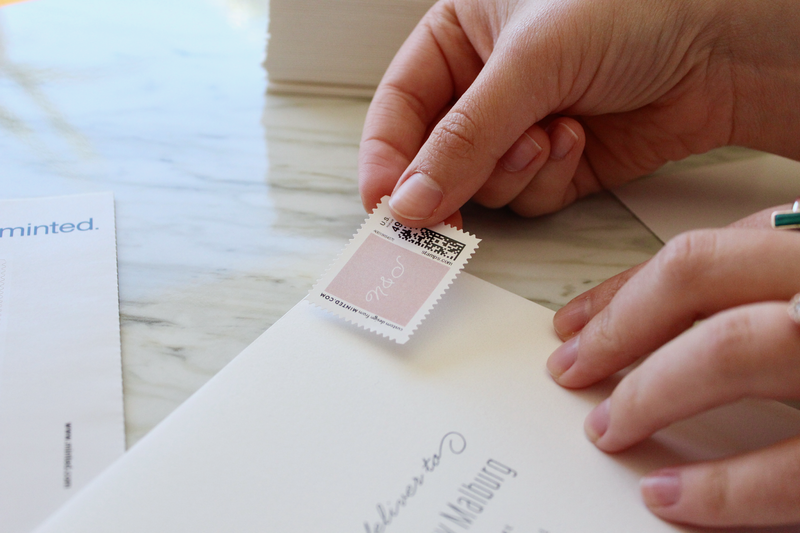 We chose pink stamps with our initials written in a pretty script. The pink wasn't quite the same shade as the wedding invitations, but we didn't mind. After we placed our order, we received an email the next day to take one last look at our final design. We were so pleasantly surprised when the designer who proofed our invitations offered to match the pink stamps to the shade of pink on the invitation. 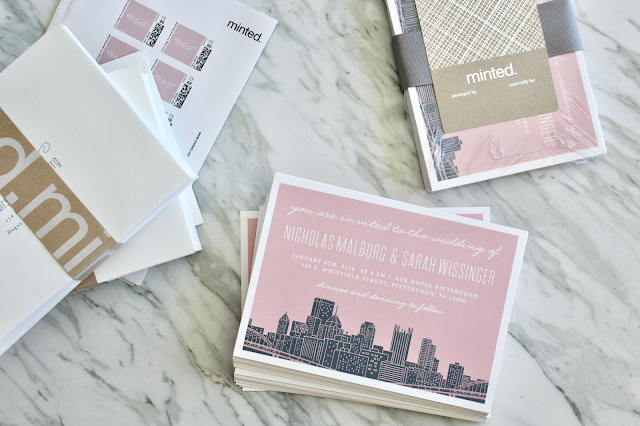 All in all, working with Minted on these invitations has been a dream come true. Not only is their site incredibly easy to use, their customer service is fantastic, and the whole process is so quick. We placed our order on a Tuesday night, approved our proofs on Wednesday, and the invitations arrived on our doorstep Saturday morning.